Stephen Grenfell’s novel details the ancient struggle of good versus evil through parallel universes. 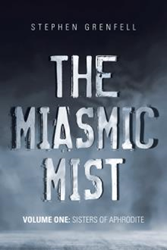 The new science fiction action-adventure novel, “The Miasmic Mist: Volume One: Sisters of Aphrodite” (published by Balboa Press), by Stephen Grenfell tells the tale of several characters and the adventures they share, beginning in 1950s Britain. The novel is the first book in a planned trilogy. It is available for purchase at: https://www.amazon.com/Miasmic-Mist-One-Sisters-Aphrodite-ebook/dp/B07DGS2FLL. The novel follows the lives of five people: a brother and sister from the British aristocracy, James and Philippa Marchant, a young man, Daniel Gibson, and young woman, Emily Wilkinson, from less elevated backgrounds, and Kelly Aresti, who is the doppelganger of the female upper class woman in a parallel universe. The novel follows the characters from their school days in the 1950s to growing up and entering the workforce. The men mainly go into military service in the Royal Marines, while the women have more varied paths. One woman becomes a lawyer while the other is studying to be a doctor. Philippa’s doppelganger Kelly is a practicing physician who is the first to pursue the evil presence that manifests itself. Steve Grenfell was born in West Hartlepool, England. After college graduation he worked in industry management and also served in the UK’s Territorial Army and Royal Marines, Reserves. Grenfell now lives with his wife in Los Angeles. They are avid world travelers including regular trips to the United Kingdom and Europe to visit family and friends.